The Defining Chapter. It all comes down to this. Will Peter Jackson redeem himself with the third and final movie in The Hobbit trilogy? It looks like that's what they want us to think. 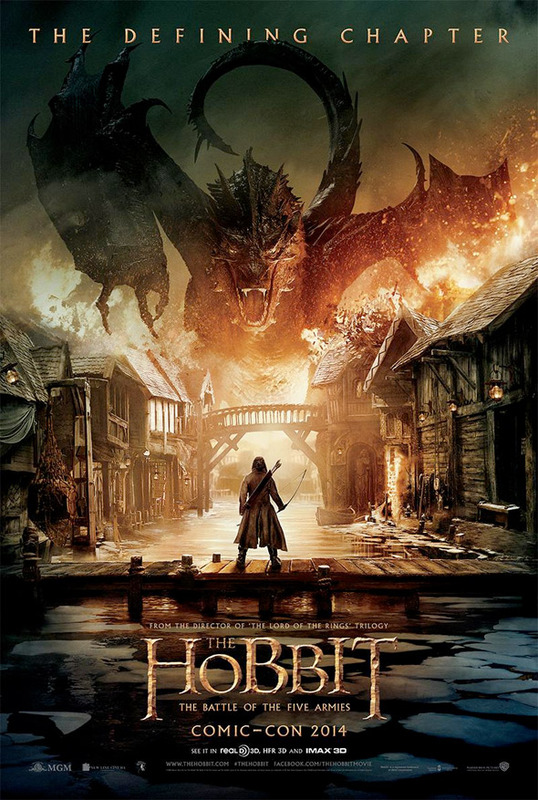 Warner Bros has unveiled the first official poster for The Hobbit: The Battle of the Five Armies, featuring an epic fire-engulfed Smaug the Dragon in a stand off with Bard the Bowman, played by Luke Evans. This is an awesome poster to debut, even though it's another "from the back" hero shot (which is the popular poster trend nowadays). With Comic-Con kicking off this week, we expect a trailer, more posters, and plenty more Hobbit hype soon. Here's the full-size poster for Peter Jackson's The Hobbit: The Battle of the Five Armies with Smaug & Bard. For reference, here's the original tweet where the new poster came from - also including Comic-Con details. If they simply made the last film a little over 3 hours then there wouldn't be any need for another. I don't think anyone would have mind that. But of course since LOTR was a trilogy their logic is of course going to be, "We need to make The Hobbit a trilogy also!". And also most importantly of course, the money. well yes, if they are making million upon millions on these movies alone (not including the entire LOTR franchise, videogames, toys, apparel, etc.) and they have an opportunity and a green light to make 3 movies instead of two, in theory bringing in 50% more profit, possibly more, then yes, I think it only makes sense that they would make 3 movies. I agree it's too much, and I was not a huge fan of the execution of these prequels either, but a studio is not an artist or a storyteller. A writer, director, cinematographer, they are the artists who would maybe tell this story more coherently, but a studio is a business, and it is the businesses job to make as much money as possible. Especially in a time when the movie industry is suffering and studios need every dime they can spare if they want to be able to make any movies at all. I'd say Peter Jackson is more of a nerd than a money grubbing business man. He's making them this way because this is what he'd want as a super nerd fan of the book. These movies are for huge LOTR/Hobbit dorks. I read the books as a kid, not a crazy fan but I enjoyed them. I assumed I'd not like the movies after reading about how they are blatant cash cows on reddit but somehow I found them extremely entertaining. I kinda think The Hobbit is a bit overrated. Oh, hey! It's the showdown I waited for over 6 hours and spent over $35 to finally get to....hooray? Don't pretend you didn't know what you were getting into with those other two movies. I honestly thought the 3rd would be the connective tissue to the 2 series and there would be more of Smaug in a movie with Smaug in the title. And, regardless of what I thought, it doesn't mean that after 2 lengthy movies myself and many other fans weren't exhausted about still not getting to the climax of the story they love. You sound impatient and cheap. Let's go Bard!!! This will be great. Lol, it looks like the same setup as the Attack on Titan poster. Wow. Guess I'm in the minority being pretty happy with how Jackson has handled this trilogy. Can't wait to watch this! I have loved the other two so far! This design is a total rip off. It's straight off Attack on Titan. You realize this is just advertising right? There's only so many designs possible and 'small hero (centered) facing off against huge villain (centered) is not some mind blowing original design idea. Oh wait but they used fire! So clever! No one better 'steal' it.